Consequently when the Aleuts saw the first Russians, who covered their heads, they called them, before any other name, saligungin, that is one having caps or hats. Before contact with the Russians, Aleutian Islanders went bareheaded except for wooden hunting hats and visors that the men wore at sea and skin caps that both women and men put on for dances and celebrations. 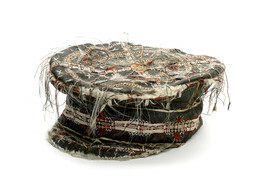 In later years, homemade Russian-style caps became popular. This man’s hat is made of stiff leather embroidered with caribou hair, cotton thread, dyed yarn, fox fur, and strips of colored seal esophagus. It is painted with a sparkling black pigment, probably a traditional mix of volcanic minerals and octopus bile. Mary Bourdukofsky: This looks like a man’s, because it’s got that visor. Daria Dirks: What do you call this? Aron Crowell: Have any of you seen any hats like this one? Vlass Shabolin: It’s the first time I’ve seen one. Mary Bourdukofsky: It’s the first time. Maria Turnpaugh: Just in pictures. Mary Bourdukofsky: Did you notice the embroidery on the top part? Mary Bourdukofsky: Very fine thread embroidery. Look at this fine fur right there [on top]. Maria Turnpaugh: It looks like fox hair. And it’s mixed with a little thread. Mary Bourdukofsky: Yes, black and red thread. Aron Crowell: And how about the embroidery stitches themselves? Mary Bourdukofsky: Cotton. How come it’s black? Do you think that’s material or is it a skin? Maria Turnpaugh: It feels like some kind of skin. Mary Bourdukofsky: Animal leather of some kind. It could be seal or . . .
Maria Turnpaugh: It also could be dyed. Mary Bourdukofsky: Skin dyed black, yes. This beautifully decorated example from Unalaska Island dates to 1868, only a year after Alaska passed out of Russian control and became a territory of the United States. While the shape of the hat is Russian, its ornamentation is purely Unangan. Embroidery in caribou hair or cotton thread, strips of colored seal esophagus (red, black, and white), dyed yarn, hair, and fur (identified by Elders as fox) mark this as a hat for special occasions or ceremonies.